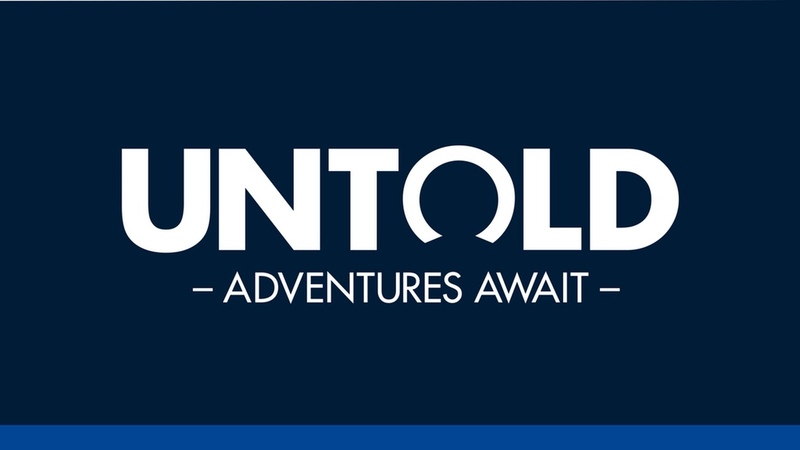 Since the Kickstarter for Untold: Adventure Awaits is running out in a little more than 24 hours, I thought I’d say a few words about it for people that consider backing it, since, as an external playtester, I’ve probably played it more than most people. A few months ago, the Creativity Hub asked around for playtesters for their new RPG/storytelling game based on their own (then) Rory’s Story Cubes (which have been sold to Asmodee by now so Rory and Co can focus more on creative stuff). I’d heard a few months earlier this was in the works and was pretty excited! I signed up but didn’t expect to be picked, after all, there’d probably hundreds of other interested people more qualified and much closer to Northern Ireland. But lo and behold, two days or so later I received a Fedex notice that a prototype from Dublin was on the way to Germany! In a way, this game is much closer to universal indie storytelling games like Archipelago III or Primetime Adventures than more well known tabletop RPGs such as D&D. In fact, that’s why I’m writing this - I think the game went a little under the radar in the storygame crowd, undeservedly so. The game can be played as a one-shot (or rather one “episode”) or over several sessions, to make a whole “season” of up to 7 (or more) episodes. The character and adventure sheets allow you to add things you’ve learned or changed over the season. There is even character progression: the sheet allows you to add two more items or abilities every two episodes. Wanna see how it looks? Boardgame reviewer Jon Purkis (Actualol) has a few hot pics on Twitter from UK Games Expo that show the latest version! The game is divided into five scenes, with each scene being represented by a card you draw at the beginning. Each scene type (Danger, Intrigue, Showdown, etc) has a different small deck of cards to draw from, with each card defining different basis tropes, like “The threat is someone accusing someone else”, or “that person was behind it all this time!”. There is an Adventure sheet where you can check off a few basic questions to define your setting, like “past, present, future, or other”, “is there magic or the like”. You can write a few words about the setting you picked and then you need to name your setting. I always found a little hard to come up with a name, now that I’m thinking about it, when we played in homemade version of our own past or future, like Victorian London or our own near future Science Fiction setting; but it should work well for settings you copy from existing TV shows, comic books (we played Mouse Guard with it several times) or novels. After drawing the scene card, you roll all remaining Story Cubes, picking out one or more to put on the “cube spaces” available on the card, thus defining e.g. the current threat you are facing, and explaining the scene setup in a single sentence. (E.g. a Danger inspired by one of our Mouse Guard-inspired games: “A pair of snapping turtles are attacking us!”) Each scene allows the players to either ask some questions to detail the scene, do a specific number of actions, or both. Asking questions, you can switch to your author hat, come up with open questions beginning with “What”, “How”, “Where” or the like. Following our Mouse Guard thread, an example would be “What do the snapping turtles want from us?”. Questions are always answered by the players, inspired by another roll of the remaining Story Cubes. Actions are things your characters can do. Menchanically, they are completely free and narrative, but your character begins the game with at least two special powers, areas of expertise, or items that can inspire your actions, of course. In one game where we played a gang of Victorian London streetkids solving petty crimes, I played a small girl with a set of pretty marbles as one of my items. I used those marbles for everything, among others rolling them to make adults stumble (several times) and once I even used the largest one to “tell someone’s dark fortune” to scare them! Action resolution is handled with a random draw of a card that shows either success or failure, plus an “and” or “but” modifier (something very like my favorite GMed freeform RPG, Freeform Universal, which I keep on yapping about), and finally a facial expression you can assign to anyone in the scene. You define your character, maybe somewhat unsually, right after defining your first threat, and are thus able to tailor them somewhat to the setting and story. Character generation involves coming up with a name, a job role, and an aim. My Mouse Guard character “Ivy” had the job role “Mouse Guard patrol leader” and the aim to “always get to the bottom of things”, for example. Further, characters begin with two “things”, similar to a Fate Aspect - a helpful item, special power, or special expertise. So Ivy could have 1. a “sling with a few stones”, and 2. special expertise in “Wayfinding”. These attributes don’t add anything mechanical and they don’t change the probability of success, but they do make some actions possible in the first place, of course, and they inspire your actions in general, see the marble example above. The game comes with four sets of cards (the only thing that actually constrains player number) that players can use during the game to change the story. Some of them seem to harken back to either Mathiijs Holters Archipelago, Holter’s and Emily Care Boss’ Play With Intent, or even further back to improv theater. There’s a card that’s basically a cross between Archpelago’s “Try a different way” phrase and an X-card, and then there’s a card that gives you a small in-between scene like Archipelago’s “I’d like an interlude”. I’ve had some wonderful times with those very simple character sheets, I didn’t need anything but my two aspects, my role and my aim to have lots of material for engaging and heart-felt character play. I could imagine some people coming from more crunchy games like D&D, though, who might think this is not enough. Some might complain that you don’t have any way to improve your chances of success. This was not an issue in our test groups at all, though. Most of us were used to more freeform games like Archipelago and Fate, however. The cards as a resolution tool were pretty unusual and cool - I’ve never thought about the facial expression of somebody in the scene as a way to see how things shake out! Very refreshing. I personally never had much trouble with it, but a small number of my test players did: from whose perspective are the questions and aswers you come up with? Do the players know this, or the characters, too? Do the characters have to be able to see the answer to the question with their own eyes or can it be (as yet) secret knowledge that only comes out later? If you or your players have a very strict division between player and character knowledge, you may run into minor difficulties now and then. One thing that I’ve become aware of over several plays is that you can truly play any setting you can dream of with Untold, since it is so freefrom. However, due to the predefined scene arc, the game does tend toward action and adventure and defeating evil. The “intrigues” are always some “bad person” or “evil thing” behind it all. This probably makes it pretty easy to understand for kids, though, and the game will work remarkably well with young kids! You can always reinterpret and adapt these to fit your story type, but it can be a little harder to come up with a more “neutral” danger like the elements or other ambiguous things. I’ve already wondered if and when they might come up woth expansion cards that have a few more neutral “intrigues” and already jotted down some of my own notes for some of them. Another difficulty I can imagine is mysteries: We’ve never tried this in a full-blown way yet, but unless you’re comfortable with coming up with the questions as well as the solutions to your own mysteries, like e.g. in the excellent Inspectres, mystery games could prove difficult with the Untold system. Der Höllenzehnt (The Hell Tithe) auf Deutsch erhältlich! Archipelago jetzt auch auf Deutsch!